NICOSIA, Cyprus Cyprus' parliament on Sunday postponed a crucial debate and vote on a levy on all bank deposits that the cash-strapped country's creditors had demanded in exchange for euro10 billion ($13 billion) in rescue money. The announcement set off an immediate scramble among top European financial officials, with reports that the European Central Bank was pressuring Cypriot authorities to hold the vote without delay. The stakes are high for the tiny island nation of one million people, because a rejection of the one-time tax by lawmakers could send Cyprus into bankruptcy and possibly out of the common euro currency. Officials also fear negative global market reaction on Monday and a run Tuesday on Cypriot banks no matter which way the voting goes. Monday is a national holiday. The vote, which had been expected later Sunday, was pushed back to Monday afternoon, parliamentary official Antonis Koutalianos said. President Nicos Anastasiades had personally requested the postponement but no reason was given, state media reported. The president was to address the nation Sunday night. The decision by Cyprus' 16 eurozone partners and the International Monetary Fund to impose a one-time tax of 6.75 percent on all deposits under euro100,000 ($131,000) and 9.9 percent over that amount was a significant shift. It marks the first time they have dipped into people's savings to finance a bailout  a move that analysts worry may roil international markets and jeopardize Europe's fragile economy. The levy is expected to raise euro5.8 billion to recapitalize the nation's banks and service the country's debt. Cypriot banks got into trouble after losing some euro4.5 billion on their Greek government bond holdings after eurozone leaders decided to write down Greece's debt last year. The demand for the levy has enraged Cypriot politicians, who have condemned it as unfair and disastrous, bringing into doubt its approval in the 56-seat parliament. At least 24 lawmakers from the Communist AKEL and the socialist Edek parties have already said they will vote it down. "There are two choices, voting in favor which allows the country to avoid a disorderly bankruptcy, or rejection, which will have us face a disorderly bankruptcy with all that that entails," said Averof Neophytou, deputy chief of the ruling Democratic Rally party. 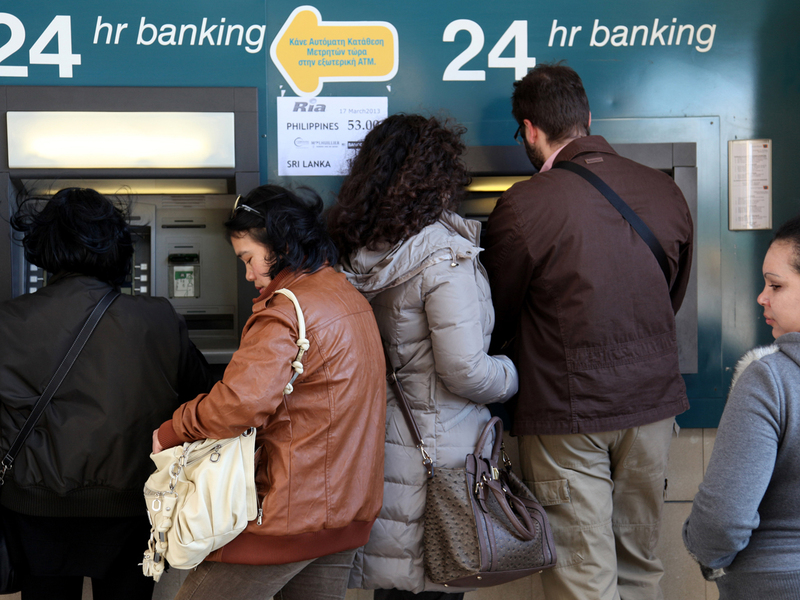 Depositors flocked to ATM machines in Cyprus on Saturday, trying to pull out as much money as they could. "It's a lose-lose situation. There will be a huge deposit withdrawal from Cypriot banks with or without a (levy)," said Cyprus Greens lawmaker Giorgos Perdikis. "We should have the courage to make the right decisions that will restore the public's confidence, which was drastically shaken." It's not only Cypriot depositors who will take a hit but foreigners as well, including many Russians who are estimated to have some euro20 billion ($26.2 billion) sitting in Cypriot banks. At their peak, Cypriot banks had assets totaling eight times the country's euro17.5 billion economy. Those numbers have prompted accusations from some European countries, primarily Germany, that Cypriot banks serve as money laundries for dirty Russian cash. "Now the faith in Cyprus as a place where it is convenient to keep one's money will be undermined," Anatoly Aksakov, president of the Association of Regional Banks of Russia, was quoted by the Interfax news agency as saying. Aksakov also suggested that some of the Russian money now deposited in Cypriot banks will move back to Russia. To counterbalance their cash loss, depositors will receive Cypriot bank bonds. Neophytou said there are efforts to back up those bonds  which have little value now  with Cyprus' newfound offshore gas reserves, although extraction is still several years away. Meanwhile, Britain's Treasury chief said the government will compensate about 3,500 U.K. troops who will lose money to Cyprus's bailout tax. British Chancellor of the Exchequer George Osborne said Sunday the government would compensate troops and civil servants. But those among the 59,000 British residents of Cyprus who not working for the U.K. military or the government could still be out of pocket.